A New Star is Born in Jamaica! This report was written by Bert Scott of the Jamaican Ambassadors Chess Academy, 3 March 2002. 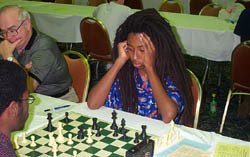 Daren Wisdom, defying the ratings and the hype, won the 2002 Jamaica Junior Chess Championship with a 6/7 score. Despite suffering a shock first round loss to un-favored Duncan Brown, Wisdom showed the true grit of a champion by scoring six straight wins including tough 5th and 6th round victories over the hot favorites Malaku Lorne and Alain Morais, respectively. In Saturday's penultimate 7th round, Wisdom needed a win over Kevin Diston to maintain his slim lead over Lorne and Morais and claim the title. After some anxious moments including a missed forced win by Diston (see diagram), Wisdom prevailed. Lorne and Morais each scored easy wins in their 7th round games, but it was too little too late. 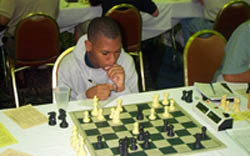 Along with the prestige of being crowned National Junior Champion, Daren Wisdom will collect $4,000, a Gold Medal, a chess book, and earned the right to represent Jamaica at all Junior International events this year. The 2002 Junior Championship field of 14 players included 7 Cadets (under 14).